Chocolate is one of the favorite delicacies of children and adults. The variety of available on the shelves doesn't stop true connoisseurs who made the sweetness at home. But not always, the product is "in store". 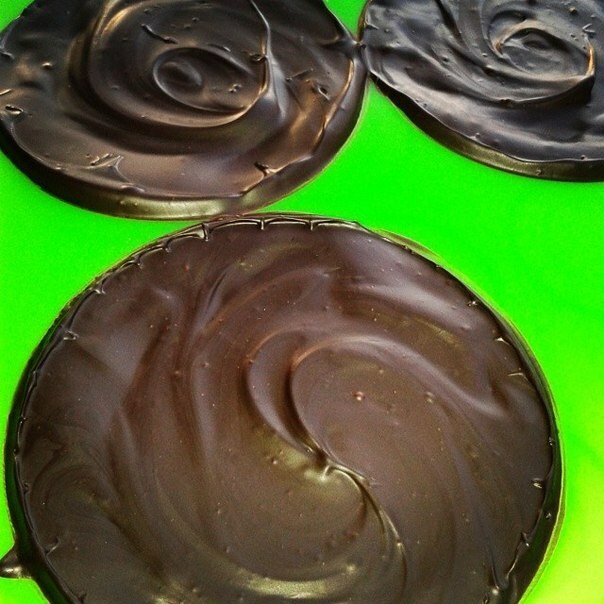 The secret lies in the tempering of Goodies. To prepare the frosting for the cake or candy is easy, you need to know a few subtleties. For example, how to bring the chocolate at home. This will require a tile store-bought treats. Should melt it in a water bath. To do this in a saucepan large volume filled with water and heated on the fire. When the temperature reaches 60oC placed on top a smaller volume of the dishes, which previously broke a treat. With constant stirring, the mass is brought to the consistency of sour cream, its temperature at this point is about 45℃. Small capacity is removed. One-third of the sweet mass is poured on a marble slab, with a wooden or ceramic blades is distributed over the entire area. The rock quickly cools the substance. Almost then put the cooled raw material to the remaining part. Check if passed tempering with parchment paper, putting on it a small amount. If the drop is frozen within 2-3 minutes, has a gloss, all failed. If not, repeat the process. Some manufacturers have recently ceased to bring the chocolate. They use a ready-made delicacy calleth. The small frozen droplets must be heated to the desired temperature in the microwave or in a water bath. But the great chocolatiers continue to carry out the procedure manually. They don't trust anyone the process of making Goodies. Homemade icing boils down to one rule: heat the chocolate to 45 ° C, cooled to 27оС and re-heated at 5 degrees. This can be done in various ways. Importantly, the molten mixture is not exposed to moisture and any other foreign matter. Then the frosting will not be glossy, with no characteristic sound at fault. Small producers as well as confectioneries, not doing all the work for the production manually. Rare production use callete. For cooking there is a tempering machine for chocolate. It can also be used at home, but the price of the device is quite high. Does this unit all the work yourself. Consists of a bowl where the melted raw materials, cooling devices, temperature sensors, vanes for mixing. The simplicity and speed of application facilitates the work of many people in the production of confectionery products.